Introduction EMSL Canada, Inc. is pleased to announce that its Calgary, Alberta laboratory has added lead (Pb) analysis in air and solids (paint, soil and wipe) by atomic absorption spectroscopy (AAS) by digestion to its scope of accreditation with CALA. The laboratory is located at 2333 18th Avenue NE, Unit 48, in Calgary, Alberta. 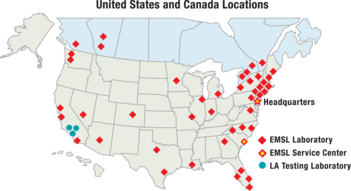 For a complete list of EMSL’s laboratory locations, accreditations and capabilities, please visit www.emslcanada.ca. For more information, please contact our Customer Service Center by calling 1-888-831-0722 or emailing info@emsl.com.